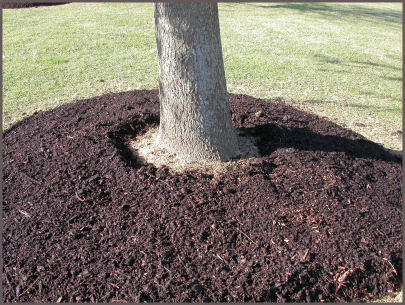 Mulch "should" extend to the drip line (B) and placing it on top of the grass (FLAT) rather then removing the grass is better. We can do more damage by removing the grass now that it is there. We are over grassed as a nation and grass will kill a tree. Only extending the much out to four feet surly is better than no mulch at all! If we take "symplastless" wood out of your trees, we can chip it up and place it right back around your trees. Fallen leaves are great mulch. 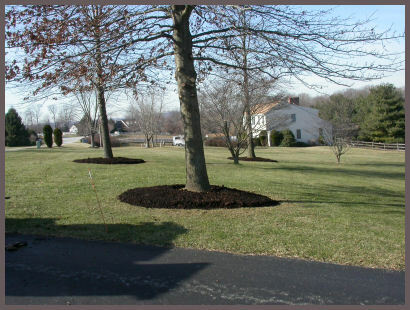 Bark mulch should be avoided. Diagrams from The Desk of John A. Keslick Jr. Call us for other FACT SHEETS on pruning and other tree care information. Notice the mulch does not touch the trunk flair.